By Michael Hingson with Susy Flory. Thomas Nelson. $22.95. It’s been almost a decade since 9/11. Thousands of stories and books containing millions of words have documented one of the most memorable days in this country’s history. This riveting celebration of life ranks as one of the best. “Thunder Dog” takes you alongside the blind author and his four-legged soul mate Roselle as they hurriedly find their way down 1,463 stairs in World Trade Center Tower 1, not recognizing why they are suddenly being forced to scramble for their lives. A lively narrative, accented with detailed description and deeply affecting scenarios, is naturally the focus here. But the special bond cemented beforehand, Hingson offers, provided the empowering resources for survival as they descend the crowded stairwell permeated by a strong smell of jet fuel. “Sometimes we move out and pass people on the left; sometimes people pass us. I switch Roselle from side to side as needed. Everyone is polite but focused. “Each floor has nineteen stairs split up into two flights. The first flight has ten stairs. At the bottom is a landing with 180-degree turn, then nine more stairs. Usually, I don’t count stairs. It’s the dog’s job to pause and let me know when I get to the top of a set of stairs and when I get to the bottom. But this time I count for something to do. “Not only am I counting stairs, I’m listening carefully. My adrenaline is pumping and I feel very alert, with all of my senses heightened. As I walk, I strain to hear and decode the smaller sounds from the building. It’s telling me a story, I don’t want to miss what it has to say. While most of us recall the vivid television shots of the attacks, from our living rooms or offices, Hingson makes an even more powerful connection to readers with his fluid writing and smooth pace throughout. Hingson adamantly disdains a total characterization of himself as blind, noting other descriptions rank higher, such as husband, friend, son, brother, cousin, for starters. “If there is just one message about blindness that I could share with sighted people it would be this: It’s okay to be blind. It won’t ruin your life or drain away all joy and satisfaction. It won’t strangle your creativity or lower your intelligence.” This superb work is total validation. 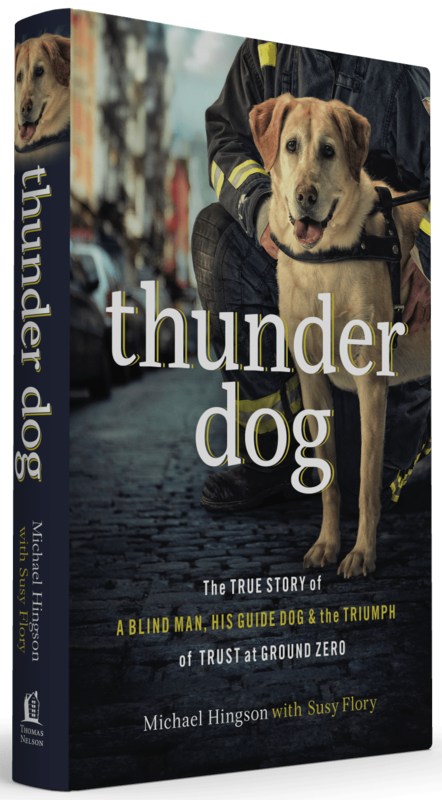 “Thunder Dog” is packed with psychological turbulence, respectful camaraderie and rock-solid confidence in a riveting showcase of the human-animal companion bond put to the ultimate test.